Discussion in 'Guitars in General' started by Lewguitar, May 3, 2016. Just received a used set of Dragon II's. Don't know what I'll put them in yet. 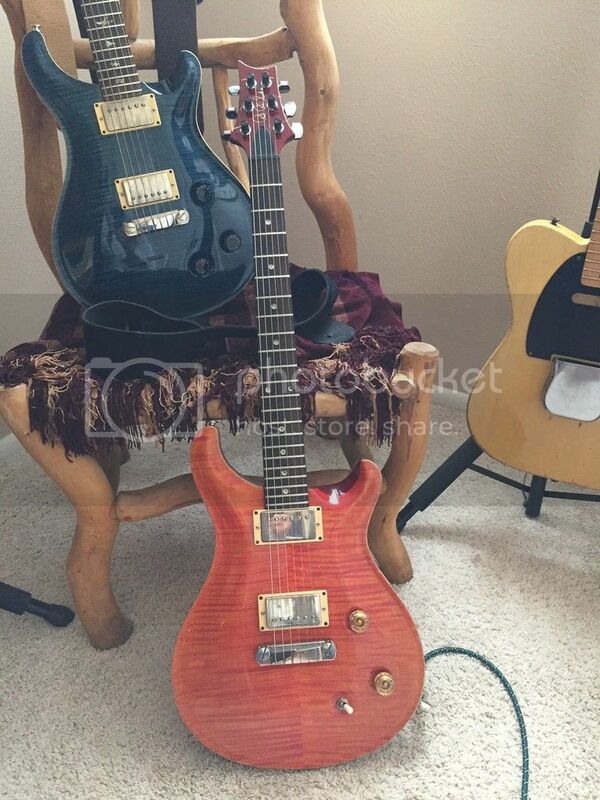 I also have a used set of Dragon I pickups that came out of my '95 PRS. My question is this: are the neck pickups in both sets the same pickup? I measured the neck Dragon I and it measured 7.58K. Measured the neck Dragon II and measured 7.8K. I know both are alnico 5. So are they the same pickups? Same copper wire? Incidentally, I measured the bridge Dragon II and it came up 12K. Measured the bridge Dragon and it came up a whopping 18.83K! I decided to put the the Dragon II's in my '95 PRS Custom 22. Every time I play my blue '02 CU-22 onstage I wish it had a 3 way switch like I put in my old '95. My '95 is beat to heck! I bought it from a pawn shop for about $800. I did a fret job on it and it plays beautifully and it's nice and resonant. It just has a lot of road wear. The worn covers on the Dragon II's match the wear on the '95 perfectly and look "right". And I like the Dragon II's more than Dragon I's it came with. The neck pickup in the Dragon I is alnico 4 and the neck pickup in the Dragon II is alnico 5. I prefer alnico 5. Otherwise they're the same pickup except for the cover on the II. The bridge pickup in the Dragon I set is a little to strong for my tastes. I prefer the Dragon II, which is still pretty strong at 12K. But I really like the way it sounds. I did open up the bridge pickup and reverse the magnet to put both pickups in phase. It was pretty easy to do. The two guitars do sound just a little different from each other. My blue '02 is a little bit brighter than my '95. And that's my '54 Esquire in that group photo. Just got it back from Naked Body Guitars and Dawn did a great job refinishing it and relicing the finish. Sometime in it's long past someone had painted it with red bicycle paint. I do have the all of the original parts though, including the pickguard, but I like the black bakelite pickguard better and I'll probably put it back together as a Tele since that's the way it was wired when I bought it 20 years ago.